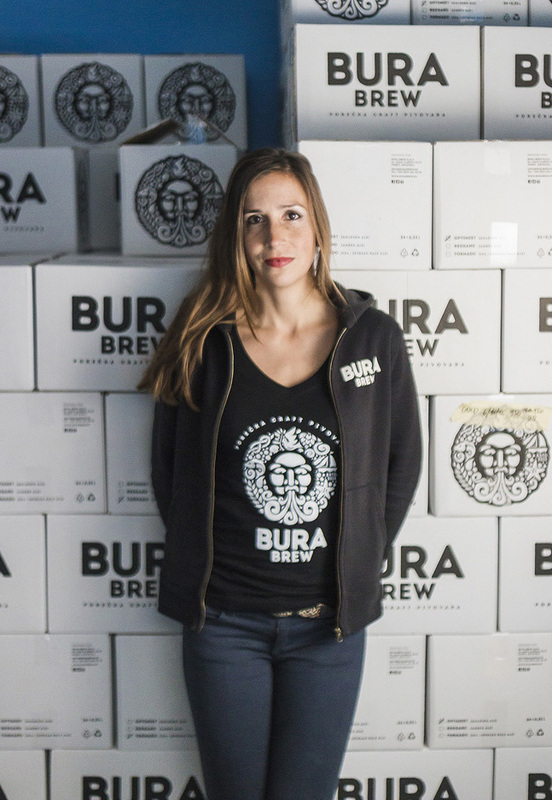 Bura Brew is an independent craft brewery. The project idea was born at the beginning of 2014 and the company was founded in March 2015. By March of the following year we were brewing enthusiastically and the dream became a reality! This dream was hard won, involving long hours meticulously developing the idea, analyzing the market, creating a detailed business plan and looking for funds and a location all while developing the recipes. The Bura team is made up of its 3 founders; Alessandro, Claudio and Veronika, all of them with different tasks, experiences and skills. “I am responsible for sales & marketing and customer relations management, however everyday duties also include loading and unloading the barley malt from the truck, delivering the beer with our Bura van, cleaning, bringing visitors around the brewery on tours, helping Veronika andbrewing the beer with Claudio. I also do the filling, corking and labelling of each and every bottle by hand. First craft beer I ever tasted: “Brighella“ by “Birrificio Lambrate“ on Christmas evening 1998. From that moment my life as a beer lover has never been the same. "The brewmaster is someone who creates beer. In reality, in my humble opinion, the brewmaster is someone who creates the conditions to achieve the final product following every single step of the process with scrupulous attention to detail, especially with regard to the very important issue of sanitation. Who really creates the beer is our Majesty, the yeast, during fermentation and maturation together of course with water, barley, malt and hops". First craft beer I ever tasted: one that I brewed myself in my garage at home in May 1997. “I manage cash flow, financial and tax issues, I also look after the orders and delivery of raw materials - the administrative side of the business. According to Alessandro and Claudio, due to my role in the company and to my being a woman, I am the boss... In reality though, every decision is taken together and I am very happy with my team and the work environment; it's funny, cheerful and professional.